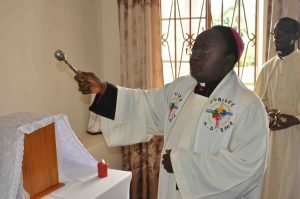 The Archbishop of the Archdiocese of Kampala His Grace Dr. Cyprian Kizito Lwanga officiated at the opening of the Academic Year at St. Mbaaga’s Major Seminary, Ggaba on Sunday 30th September 2018. The Archbishop witnessed the Age-Old tradition of the Church that requires seminary lecturers to take an oath to uphold the Church’s teaching regarding Faith and Morals. 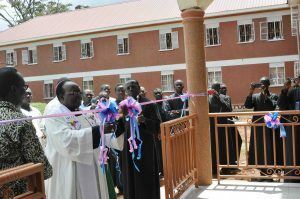 After seven years of patient struggle and determination, St. Mbaaga’s Major Seminary, finally with pride unveiled the new extension of a new multi-purpose building. It has an oratory and it accomodates 65 seminarians, 5 guests in self-contained rooms and 5 staff members. This building also has a 600 seater main hall to cater for different functions of the seminary. This enormous project has been possible by the generosity of different institutions and donors. 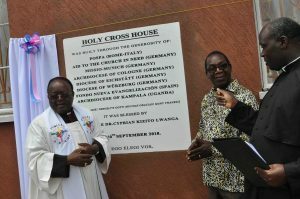 His Grace Dr. Cyprian Kizito Lwanga, the Archbishop of Kampala officiated at this grand ceremony of blessing and openning the building. He was assisted by the Rector of the seminary Rev. Fr. Dr. Joseph Sserunjogi. The students community and staff in jubilant mood joined in the celebration with music and ululations. 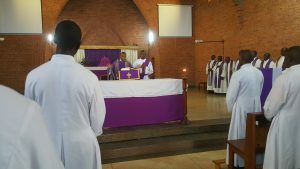 In the Eucharistic celebration for the opening of the academic year 2018/2019, the Archbishop of Kampala who is also the President and Chancellor of St. Mbaaga’s Major Seminary,Ggaba introduced the new members of staff he has appointed as full-time resident fomators and lecturers. Rev. Fr. Thomas Tusuubira from Kampala Archdiocese. Rev. Fr. Dr. Hillary Munyaneza from Kampala Archdiocese. Rev. Fr. Dr. Joseph Mary Ssebunnya from Kampala Archdiocese. Rev. Fr. Francis Musoke from Lugazi Diocese. Rev. Fr. Alvin Lawrence Ttendo from Kampala Archdiocese. Two members of staff have been appointed to other Institutions within the Church. Rev. Fr. 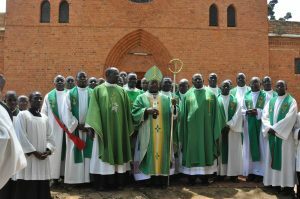 Pontian Kaweesa, a longtime lecturer of Dogmatic Theology was appointed by the Vatican to be the National Director of the Pontifical Mission Societies at the Uganda Catholic Secretariat, Nsambya. Rev. Fr. Yiga Lawrence Sseguya has been appointed as formator and science teacher at Christ the King Minor Seminary, Kisubi. Rev. Fr. Alex Kambagira from Kampala Archdiocese;Rev. Fr. Andrew Kato from Kampala Archdiocese; Rev. Fr. Joseph Mugamba from Kampala Archdiocese; Rev. Bro. Fr. Andrew Kyagulanyi from Kampala Archdiocese; Rev. Fr. Cosma Masanga from Luweero Diocese; Rev. Fr. 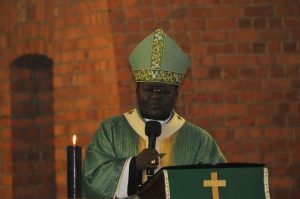 Gonzaga Mayanja from Masaka Diocese; Rev. Fr. 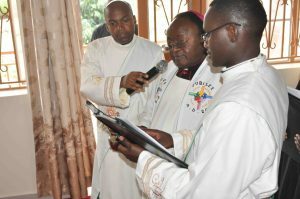 Mbaaga Tuzinde Ssenkungu from Masaka Diocese; Rev. Fr. Moses Oboth from Lugazi Diocese; Rev. Fr. Dominic Acema from Jesus the Divine Master, Arua (in absentia). On the 8th of February 2019 we had a succesfull workshop on reading Laudato Si in a seminary setting. The philosophical reading of Laudato Si. 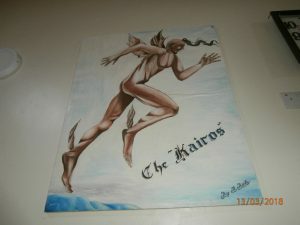 The painting of Kairos was installed in the main hall on the 8th of February 2019. Kairos, was a young man, agile and handsome. Statues of him could be found all across the Greek peninsula, but the most famous stood in now-ruined Sikyon. The painting is to remind students to be conscious of each moment in life as an opportunity to be grabbed and not wasted. We adapted the original words inscribed on the statue of Kairos. Who and whence was the sculptor? From Sikyon. And why do you have a pair of wings on your feet? I fly with the wind. Why did the artist fashion you? For your sake, stranger, and he set me up in the porch as a lesson. To view the program click on the link. From 28th of February to 2nd March 2019 we had a succesfull workshop on Basic Christian Communities for all future Church leaders. 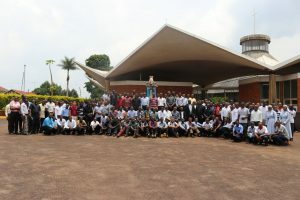 It was attended by seminarians from both St. Mbaaga and St. Mary’s National Seminary Ggaba. This workshop was facilitated by the pastoral department from AMECEA (Association of Member Episcopal Conference of Eastern Africa). To learn about the seven steps of Lumko click on the link. This method can help to grow in Christian life. To read the program click on the link workshop program. 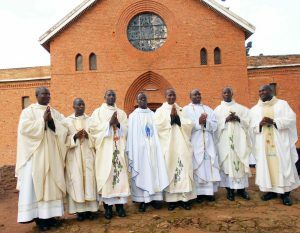 A second priest of the Neo-Catechumenal Way movement, Father Denis was ordained for the Archdiocese of Kampala. 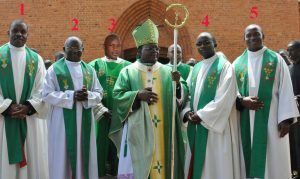 His ordination was on the 13th of January 2019 by his Grace for Cypian Kizita Lwanga Archbishop of Kampala, Uganda. 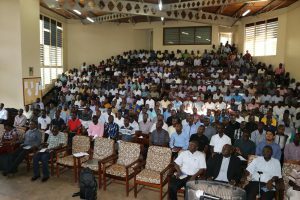 He joined the community of St. Mbaaga in a sacrifice of Thanksgiving which he led in the seminary chapel on Wednesday, 13th March 2019.